Work on the Anambra-China Airport is set to resume after the Chinese Ambassador to Nigeria promised to get his government intervene in projects being handled by Chinese companies in the state. This development follows an appeal by Governor Willie Obiano to China to assist in facilitating the prompt completion of some projects being handled by Chinese companies in Anambra State, especially the International Airport at Umueri. The governor made the request when the Chinese ambassador to Nigeria, Zou Pingjian, paid him a courtesy call at Governor’s Lodge, Amawbia on Thursday. He stressed that due to delays in the project execution at the airport site, Anambra government offered to undertake the construction of a section of the runway while hoping that full work would soon resume there. The governor said by the time the airport would be completed, Anambra hoped to have more Chinese presence in the state as some tertiary institutions now offer Chinese language in their course curriculum. He urged them to use the opportunity provided by the visit to see some tourist sites, cultural artefacts and centres, to explore for improvements. “This will go a long way in helping to cement our ties,’’ he explained. Pingjian explained that the aim of his visit was to explore cooperation opportunities at the state level, and noted that the relationship between China and Anambra had been cordial and productive and as such, should be across board at all levels. He commended the governor for his vision, saying that China was working in the same direction, in line with the vision of the Anambra government. “In China, the Congress last Friday, passed a law on foreign investment which is in line with the vision of Anambra State. China is creating more enabling environment for foreign investors to support growth of the state,” he said. He re-assured of Chinese government’s readiness to assist to speed up all projects being handled by Chinese companies in the state. Top government functionaries present at the event included Secretary to the State Government (SSG), Solo Chukwulobelu, and Primus Odili, the Chief of Staff. Meanwhile, following the meeting, the Anambra government has continued to strengthen efforts at diversifying partnership with China to boost cultural relationship, according to Obiano. The essence of the visit was to promote cultural exchange through establishment of Anambra-Chinese Cultural Centre and to finalise plans to train youths in China. The proposed cultural centre would have a theatre and other facilities that would facilitate a cultural exchange between Anambra and China. Obiano, while receiving the ambassador and his team, called on Chinese government to establish a consular office in the state as a vast number of Anambra people travel to China for business purposes. “Right now Chukwuemeka Odumegwu Ojukwu University is offering Mandarin language. We are doing all these to consolidate our relationship with China,” the governor said. The governor stressed that the state government earmarked land for the construction of Anambra State China Cultural Centre and Theatre Art. He said the state has rich cultural heritage and potential that has yet to be harnessed. 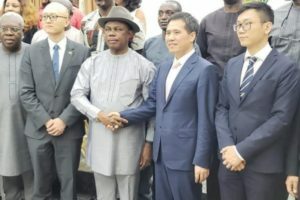 Pingjian commended Obiano for creating investment opportunities in the state, and noted that China’s main reason in seeking partnership with Anambra State was to harness the state’s rich cultural values and promote commercial activities. He stressed that they would collaborate with the state to create enabling environment for more business opportunities. Sally Mbanefo, commissioner for Diaspora Affairs, Culture and Tourism, explained that the partnership was as a result of the relationship the state had built with China through cultural exchanges. She noted that Anambra in the past one year enjoyed cultural exchange programmes with the Chinese, which led to high interest being developed between the two countries. Mbanefo said Anambra cultural troupe was the only team invited by China to Abuja during celebration of the Chinese New Year 2019, saying some youths from the state would be trained in China at the invitation of the Chinese government.